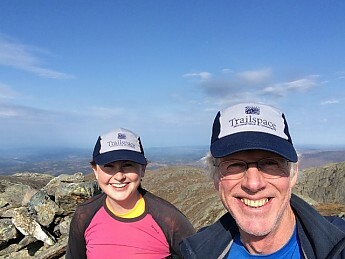 Today Molly and I did a 20k run/hike up a little peak called Storsakarven. I gave here on of my two new TS caps (she's a member too). Here we are on top. I love outdoor family pics, BigRed! Thanks for sharing this one of you and Molly. Great smiles! Now you have my Googling "Storsakarven." That was a typo, it should be Storskarven, means something like "big rocky mountain". Skarven seems to be a popular name for mountains here, maybe something like "baldpate" or "baldface" in NH/ME. There are three Skarvens in the Romsdal area alone, so if you google it you might get hits from all over Norway. Could also mean "the cormorant". Ah ha! Now I can find Storskarven.